Haiko Cornelissen's lush, living PicNYC Table is a brilliant plant-growing furnishing that brings a taste of the outdoors to every meal. The aluminum table is deep enough to double as a planter bed, and it can grow everything from grass to herbs and flowers. We caught up with Haiko at this year's Wanted Design exhibition during NY Design Week to ask him about his inspiration and snap some firsthand photos - read on for a closer look! Haiko Cornelissen was inspired to create the picNYC Table by his experience living in a tiny apartment in Paris. The apartment lacked space for a full dining table, so he often invited guests out to the garden to dine amid the flowers and grass. When he left Paris, Haiko longed for those al fresco meals – so he created a dining table that could recreate the experience in any living room. The picNYC Table is made out of lightweight aluminum that is cut and welded in the US. The table is deep enough to plant grass, herbs, and other small plants – or it can be sowed with stones or other materials for a zen garden effect. 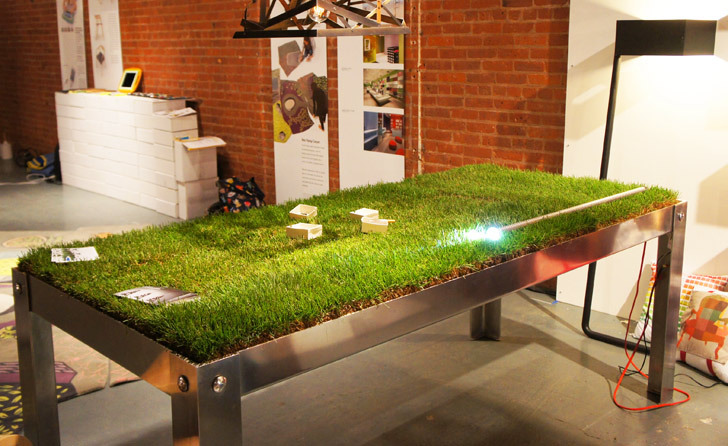 The table is currently available from Voos Furniture, and if it is ordered in New York City it can be delivered already installed with grass! Haiko Cornelissen was inspired to create the picNYC Table by his experience living in a tiny apartment in Paris. The apartment lacked space for a full dining table, so he often invited guests out to the garden to dine amid the flowers and grass. When he left Paris, Haiko longed for those al fresco meals - so he created a dining table that could recreate the experience in any living room. The picNYC Table is made out of lightweight aluminum that is cut and welded in the US. The table is deep enough to plant grass, herbs, and other small plants - or it can be sowed with stones or other materials for a zen garden effect. 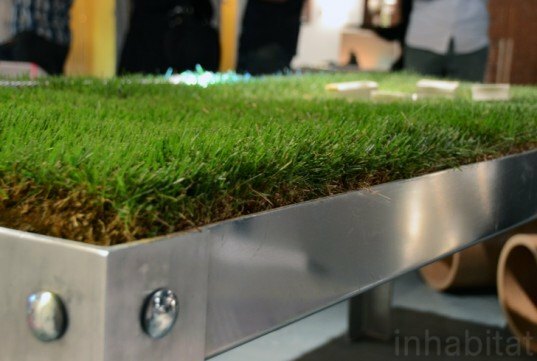 Who needs Central Park when you have this grassy table?